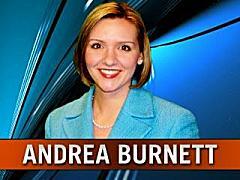 Reporter Andrea Burnett, who joined NBC5 only last January, is the latest casualty of corporate-mandated downsizing. She's being let go at the end of the year. Burnett came to NBC5 from KDFX-TV in Wichita Falls. She joins NBC5's Richard "Cash" Sirois, Ramona Logan and Loriana Hernandez in the station's recent or soon-to-be unemployed ranks.